Travertine tile is a great choice for kitchen and bathroom floors and walls. Durable, beautiful, easy to clean, reliable, and cost-effective, travertine tile is suitable for kitchens and bathrooms of all sizes and styles — from modern to traditional decors. Interior designers, homeowners, and builders alike favor travertine floor tile and travertine tile backsplash designs in their remodels and projects. Suitable not only for kitchens and bathrooms but also for any other part in your home, these tiles present the material that you can count on and expect to last and serve you well for many years to come. When looking to find the best floor or backsplash tile, make sure you have all the information you need to make a well-thought choice. 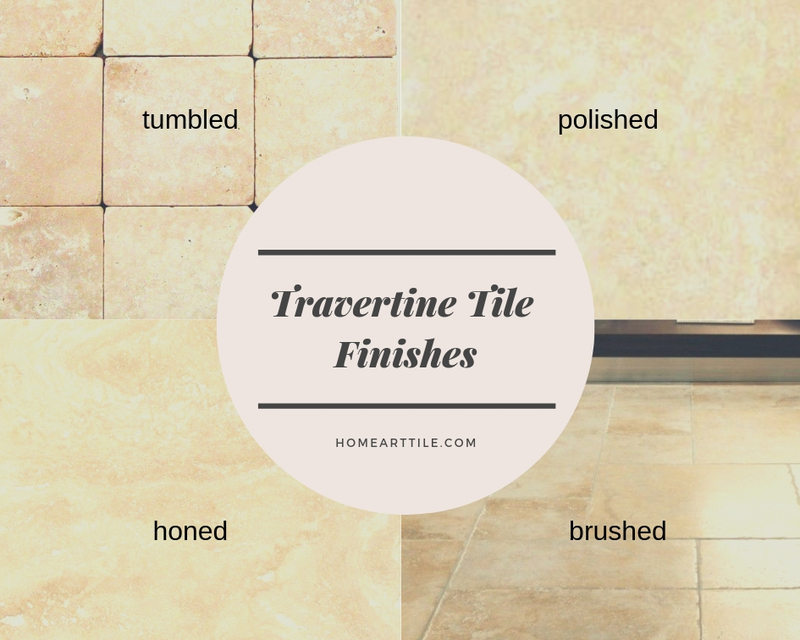 In this blog post, we will give you all the information you need — from travertine tile pros and cons and tips on how to clean travertine tile to travertine floor tile ideas, travertine tile backsplash ideas, travertine tile colors range, and travertine tile cost. Read more to learn all that you need to know about travertine tile before you start your remodeling project. 1 What is Travertine Tile? 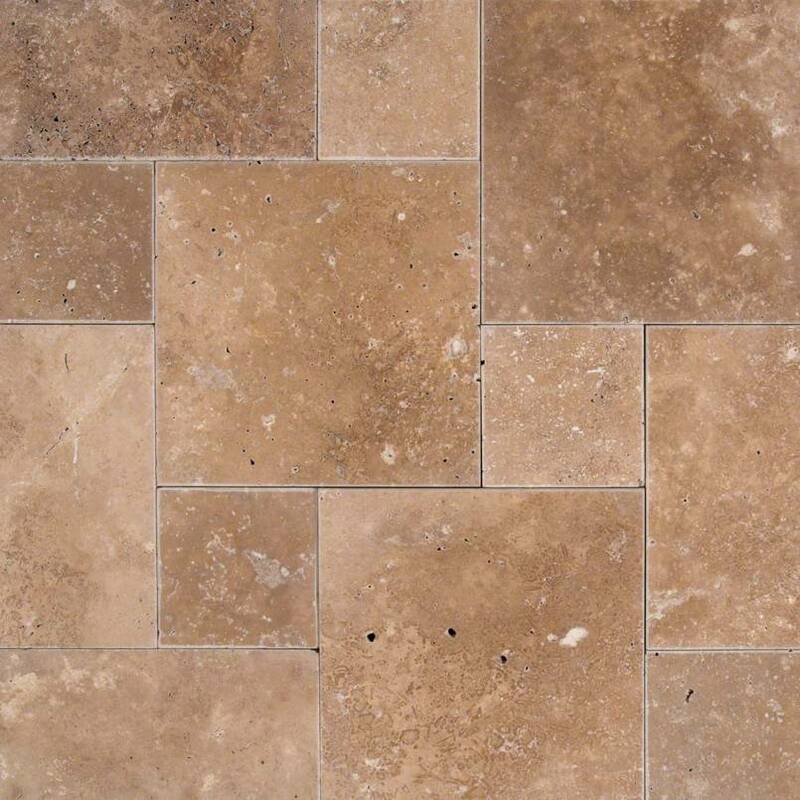 3.1 How Much is Travertine Tile per Square Foot? 6 How Durable is Travertine Tile? Travertine is a natural, terrestrial sedimentary rock stone considered to be a type of limestone deposited in mineral, hot springs. The stone’s primary purpose continues to be in construction and building throughout the history. It is commonly available in tile and most commonly used for floor and wall installations. The main characteristics of this stone are pitted holes and troughs in its concentric texture and porous surface. However, travertine can be polished to a highly shiny and smooth finish. The stone comes in many various colors, from beige and white, to gray, brown, and coral red. The name of travertine tile is derived from ”travertino”, the Italian word that comes from Latin tiburtinus ‘of Tibur’ or the origin of an area near Rome — Tivoli. This comes as no surprise because Italy is well-known for travertine. This stone comes in many colors and shades which is no wonder as it is a natural material. Unpredictive, travertile tile colors are exciting and offer many interesting choices. The most common travertine tile colors range from white and beige to brown and red. However, there are many precious varieties in between. Ivory or pale cream; Navona — almost white, very light beige with a rustic look; Onyx Light – yellow color in honey tones with onyx veins on a white background; Beige – ranging from the lightest ivory tones to pale beige; Durango – light khaki, cloudy ivory tones speckled with small black spots; Emerald – pale shades with faint green hints; Emerald Light – dim green veins on white background; Walnut – many mid-range brown tones; Chocolate – profound, intense, rich brown color; Gold – strong tones of honey golden; Classico – a classic color and pattern of travertine tile that looks much like natural cork; Rosa – an intense rose pink shades flecked with cream tones; Silver – light ivory tones with hints of gray; Scabos – stone with many varied colors that range from dark red rust to very light honey shades; Philadelphia – travertine stone with earthy shades, and medium tan colors with a lot of natural striations; Mina Rustic — beige and walnut with some black and yellow veining; Mina Dark — often described as light walnut, it is a bit darker than Beige; Noce — walnut shades, from gold to dark coffee color. Honed travertine tiles boast flat and satin-like smooth surface with a matte finish. This finish is most commonly used for residential applications, in kitchens and bathrooms. Polished travertine tile is has a shiny surface that resembles marble. This finish is most commonly used in commercial applications. Brushed travertine tile is characterized by a matte finish and somewhat rough texture. It has an antique appearance and it is especially convenient because it’s less slippery compared to other finish types. Tumbled travertine tile look the most natural of all other finishings. These tiles have rich texture but no shine. The edges boast with a worn look to resemble ancient stone look. This type of finishing is the most commonly used in outdoor applications. Saw Cut travertine tiles is the most matte finish of all because it doesn’t include honing or polishing. Polished travertine tile will give better light reflection and introduce the fresh, new look. They are especially suitable for modern, contemporary kitchen designs. Depending on your taste, current trends, and the decor style of the rest of your home, you can choose any of the finishing options. The overall theme of your home will finally determine travertine tile style, finish, and color. These natural stone tiles come in many sizes, all accommodated for commercial and residential use, as well as for interior and outdoor applications. The sizes range from small tile pieces great for backsplash mosaics and wall use to large tile pieces fitting for floors and commercial applications. Travertine colors vary and not all colors are available in all sizes. This is why it can be, more or less difficult, to always find consistent pieces. Homeowners who are looking to remodel their kitchens, bathrooms, and foyers, should be aware that travertine tile is very well priced and is one of the most affordable tile options. How Much is Travertine Tile per Square Foot? The least expensive travertine tile cost $3 per square foot, the maximum cost for the installation of travertine tile is around $30 per square foot, while the average is about $15 per sqft. Travertine tile cost is influenced by the type of tile, whether the tile is sealed or not, as well as the type of the tile finish. For example, buying travertine tiles by piece rather than in slabs will make the cost higher sometimes by 50% even. Natural travertine tiles are the least expensive while those with a specific finish will cost more. Polished, tumbled, honed and otherwise treated travertine tiles will cost more than an untreated option. Travertine tiles with special finishes usually cost from $15 to $30 per square foot. The price of travertine tile will always depend on the overall quality of the stone. These floor tiles make an excellent choice both for kitchens and bathrooms. Travertine floor tiles have excellent properties and can serve you for many years despite wear and tear and foot traffic even in the busiest of kitchens. Gorgeous textures make them eye-catching and an absolute style necessity. Quality finishes boost their durability and ease of maintenance. Depending on the style of your kitchen, choose polished travertine floor tiles for modern, contemporary, minimalist and sleek looking kitchen decors. Tumbled, honed, or brushed travertine tile will give a classic, traditional kitchen an antique, precious look. Here are some ideas on how to use travertine floor tiles in your kitchen. Kitchen decor with base charcoal gray shaker cabinets, light marble countertops, white subway tile backsplash featuring gray grout, and travertine floor tiles installed in a herringbone pattern. Wood paneled kitchen hood, stacked wood shelves with iron corbels, and stainless steel appliances emphasize the beauty and warmth of travertine tile. 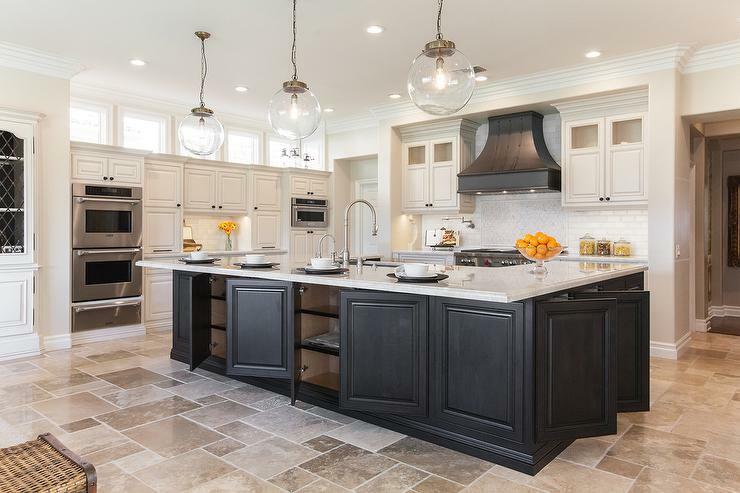 Large open kitchen concept allows travertine floor tile to shine in all its glory in this beautiful kitchen. 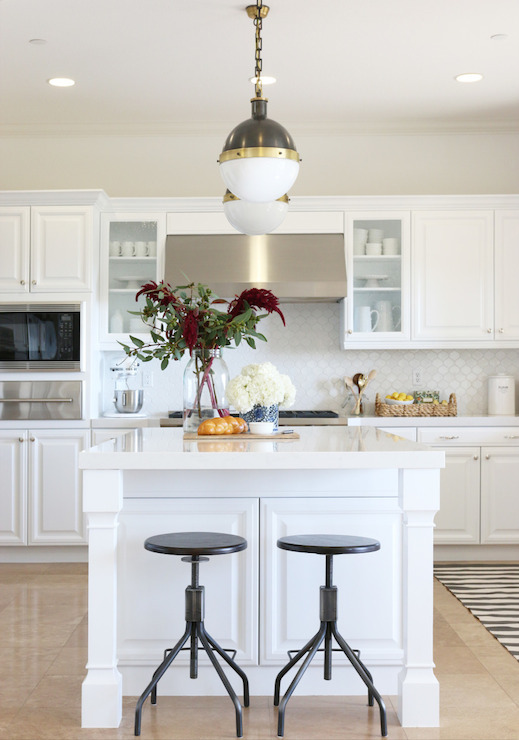 Black center island with practical storage cabinets, white quartz countertops, ivory cabinets, white beveled subway tiles, and white iridescent arabesque tiles create a classic kitchen decor. Travertine floor tiles create a stunning base for the whole kitchen and introduce irresistible warmth to it. 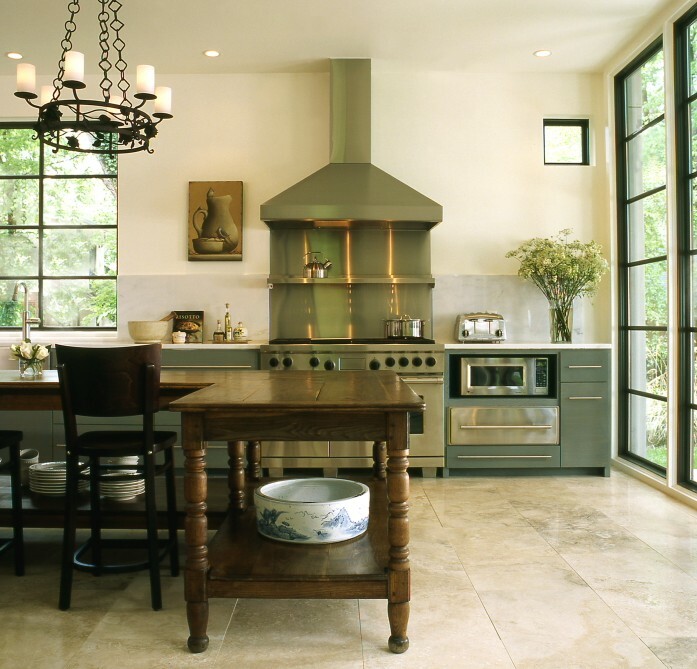 White kitchens love travertine tile’s warmth and natural, organic appearance. 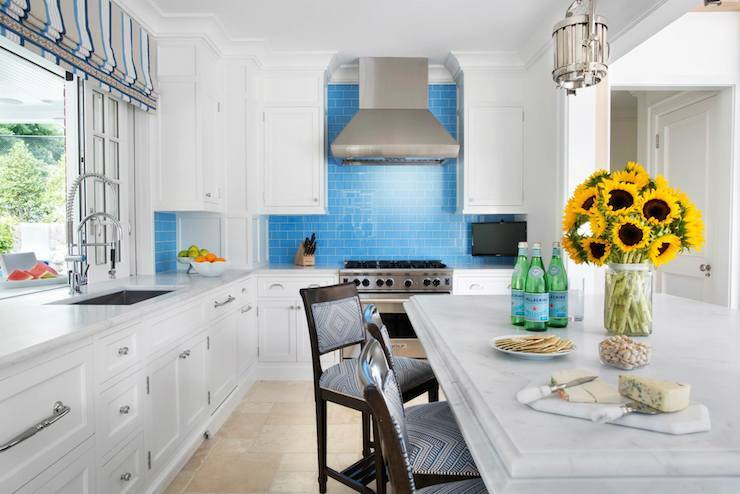 White shaker cabinets, white marble countertops, stainless steel range hood, and bright blue glass subway tile highlight the contemporary character of this lovely kitchen. Travertine tiled floors balance this clean decor and give it much needed warmth. Travertine tile looks like it’s made for Mediterranean style kitchens. And it’s no wonder because we know that travertine name comes from the Italian language. 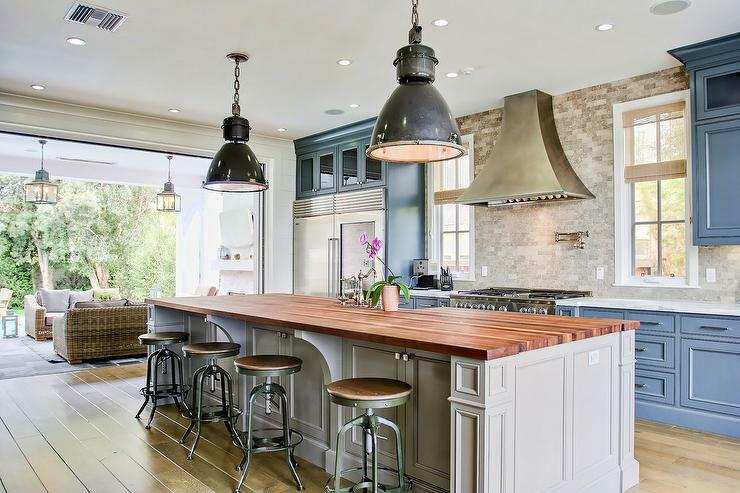 This eclectic Mediterranean kitchen boasts iron candelabra over the kitchen dining table and brown leather bar stools. 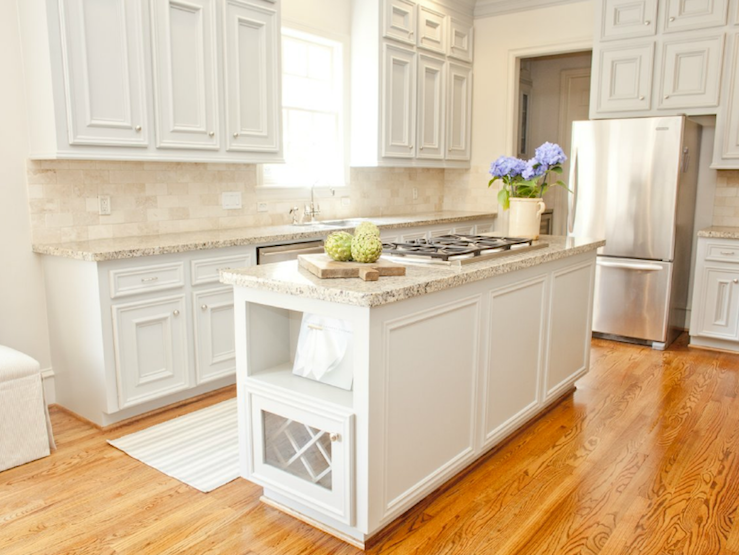 Modern green flat door base cabinets are flanked with white marble countertops. Stainless steel hood and stainless steel cooktop over the gas range create a beautiful flow that ends with a magnificent looking floor covered with travertine tile in earthy tones. Stunning kitchen features walls painted Benjamin Moore White Heron over raised front cabinets adorned with brushed nickel hardware and Caesarstone Frosty Carrina countertops alongside a Walker Zanger Hexagon Mosaic Tile backsplash. The stunning U shaped kitchen decor boasts raised glass front cabinets, a stainless steel appliances and vent hood, and a large center island illuminated by two gorgeous gray and gold pendants. The base for this kitchen design gives the timeless look of travertine floor tile. Backsplashes are a necessary item and an important decorative element in any kitchen. Travertine wall tiles can create highly attractive, elegant looking, and durable options for anyone looking to remodel an existing kitchen or to build a new kitchen. Long-lasting, travertine mosaic tiles are easy to clean and present one of the most affordable backsplash options. However, depending on the size of the area you plan to cover with travertine tile, they can also be an expensive material. 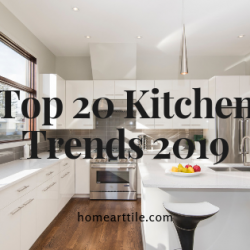 You can plan to cover only a portion of your kitchen walls between the cabinets and countertops or you can decide to choose a more dramatic solution and tile the entire kitchen wall above countertops and base cabinets. Whatever approach you believe will work better in your kitchen, make sure to measure the wall area you plan to cover using travertine mosaic tile, calculate the square footage, and find out how many travertine tiles you will need. Now it’s time to decide on the style, color, shape, and finish of the travertine wall tiles. These travertine tile backsplash ideas will help you determine what tyoe of travertine tile would work best in your kitchen. 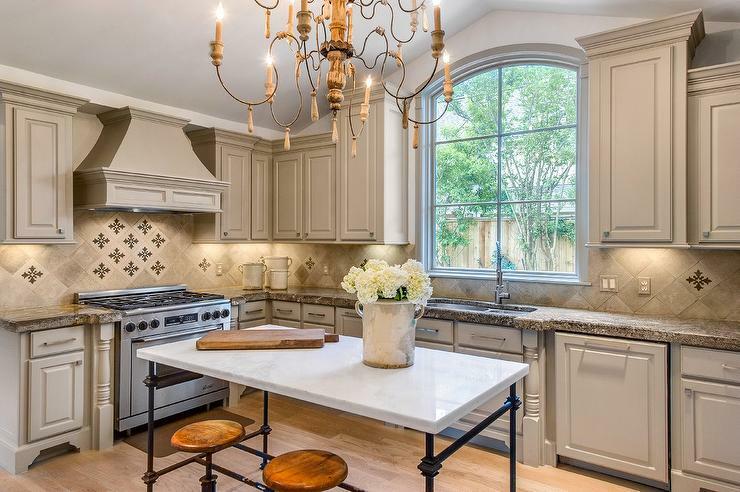 This kitchen in French style features travertine backsplash tile arranged in a diamond pattern. Their natural beauty is enhanced by light gray traditional style kitchen cabinets and gray granite countertops. 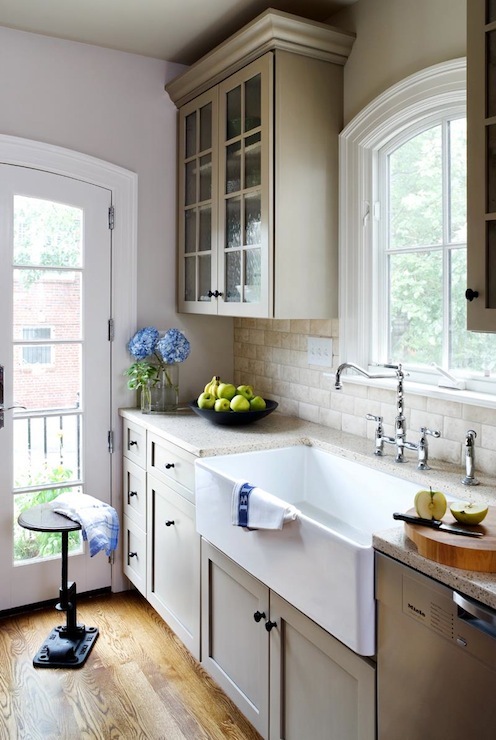 Blue and gray make a lovely pair, especially with lovely travertine tile backsplash! 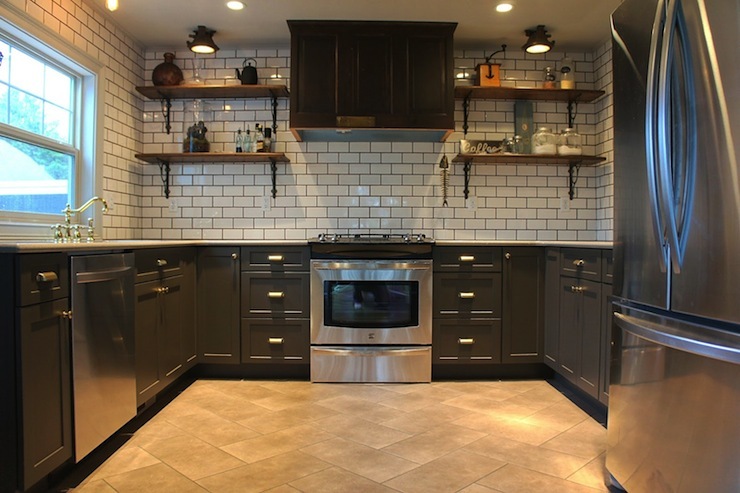 An amazing combination of traditional and industrial style is meeting halfway in this eclectic kitchen decor. Soft and warm tones of these travertine subway backsplash tiles introduce a dreamy, neutral look to this traditional kitchen decor. Very light gray kitchen cabinets and granite countertops add to the classic look and feel. Greige modern kitchen cabinets, iron hardware, light quartz counters, and beautiful travertine mosaic backsplash tile create a great combo in this transitional kitchen decor. 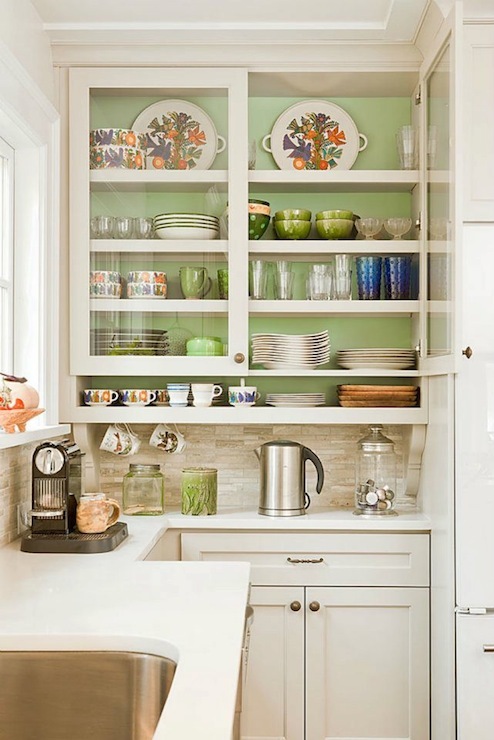 Light gray shaker kitchen cabinets with beadboard cabinet backsplash painted green, and travertine tile backsplash mosaic create a neutral design that works great in any kitchen. How Durable is Travertine Tile? Travertine tiles are very durable and highly moisture resistant. Stronger than porcelain, vinyl, marble or wood, they are a cost-effective alternative for all who love the natural stone look. Crack-proof when you handle them with care and easy to maintain, travertine floor tiles and travertine backsplash tiles will serve you well for many years. When it comes to hardness, travertine tile can compare to those made of marble. High traffic areas in your home or in a commercial space even will always look like new when covered with travertine floor tile. Make sure to properly install your travertine tiles and care well for them, whether you have them on your walls or floors, and they will give you everything you expect from a high-quality tile, and more. Like any other natural stone tile, travertine tiles have their pros and cons. Learn what are they to easily decide whether you’re going to include them in your kitchen or bathroom renovation. The Price. Travertine tile price is a reason why many homeowners, designers, and builders choose it for their kitchen and bath projects. The stone is durable similarly to marble, granite, and other natural stones but is cheaper. Appearance. With a timeless look, various tones, patterns, and many different colors, travertine tile offers an amazing, versatile look. Durability and resilience. Travertine tiles add exceptional value to any home or commercial space. They can be used for many various applications, from floors and walls, kitchen and bathroom, to foyers, hallways, and even for exterior applications as they tolerate extreme temperatures. Non-slip texture. This feature makes travertine tiles easy to walk on. Easy to install. Installing and replacing travertine tile is very easy. These tiles are easily cut, shaped, and arranged in various patterns. Porous structure. Their surface can tear or wear in the long run. Sealants and polishing products should be used to prevent this. Reactivity. Travertine tiles are very reactive and sensitive to acidic substances. They can react to acidic foods too. This is why they are not the perfect choice for kitchen countertops. Maintenance. You shouldn’t use vinegar and other acidic substances to clean travertine tiles. Sealants and more care are needed. Travertine tiles will provide a gorgeous appearance in your kitchen or bath. Carefully weigh their pros and cons to bring the right decision. Travertine tile care is necessary to keep them in the best shape and original form in the long run. Following tips will help you to keep their beauty, functionality, and durability for many years to come. Clean liquid spills as soon as they happen to prevent staining. Use special products to seal and clean tile surface. Travertine tiles are porous and need to be sealed prior to installation. This is the best way to prevent absorbing spills and dirt buildups in tile’s tiny pits and holes. Reseal travertine tiles periodically to keep them in shape and protect them properly. Wipe spillages like juice and tomato as quickly as possible. For everyday cleaning and maintenance, use dry mops. The best cleaner for travertine tile is any alkaline based stone cleaner. You can use it for day to day maintenance. 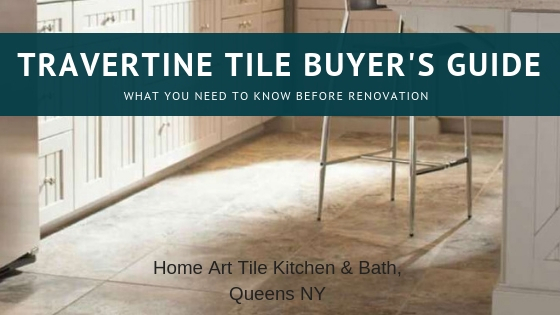 If you love unique veining, gorgeous shades, and neutral tones and you’re convinced that travertine tile is the best option for your kitchen or bath renovation, stop by Home Art Tile Kitchen & Bath at 35-10 43rd Street Long Island City, New York. Located only 5 minutes drive from Manhattan and very close to Brooklyn, we offer the most competitive pricing on travertine tiles. Many gorgeous colors and finishes in our travertine tile selection will make your remodeling project easy. 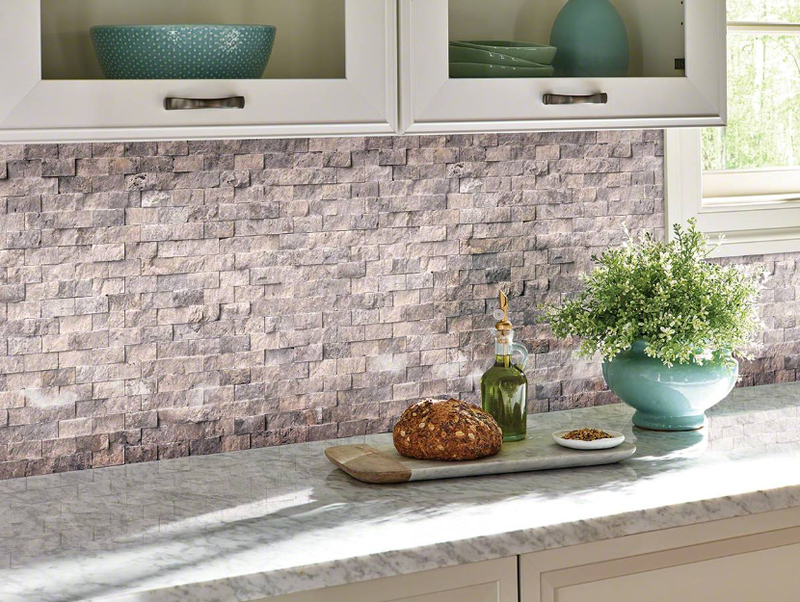 If you need a new backsplash for your kitchen, choose between Tuscany Scabas, Durango Cream, Ivory Travertine, or Tuscany Walnut. Here, you can find many more travertine wall tile options for your kitchen backsplash or bathroom wall. 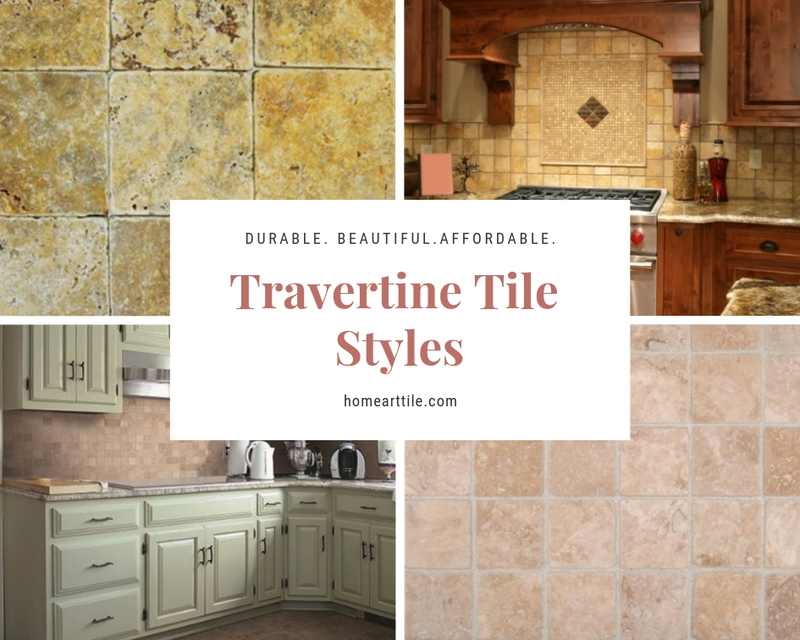 If travertine tile is the perfect solution for your floors, stop by our tile showroom and choose from many travertine floor tile options we offer. Our designers will help you choose between many options we offer and provide you with expert advice. Contact us today to start creating your dream home.